The Millennium Cohort Study is following 19,517 young people born across the UK in 2000-01, building a uniquely detailed portrait of the children of the new century. The last survey of parents and children took place in 2015/16 when 11,726 young people took part. The analysis of data on physical development is published for the first time today. 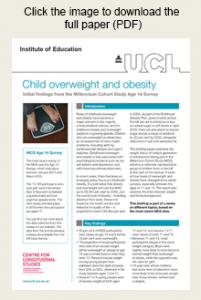 The study is funded by the Economic and Social Research Council and a consortium of government departments, and managed by the Centre for Longitudinal Studies at the UCL Institute of Education.